Bruce High Quality Foundation, 'The New Colossus' at Lever House, installation view. In a nation increasingly polarized by attitudes toward public spending, are privately-funded organizations better poised to showcase politically motivated art than public museums? It’s a question Ken Johnson recently asks in the New York Times, writing on the Bruce High Quality Foundation’s exhibition at New York’s prestigious Lever House. The BHQF is a collective of primarily Cooper Union alumni that has distinguished itself over past few years on the international exhibition circuit with challenging and playful installations, performances and videos, often robed in political critique and satire. I wonder what the denizens of this zone of corporate business and super-expensive domiciles think about the Bruces’ agitprop? It is hard to imagine many of them being aroused to revolutionary fervor. Still, the incongruity itself is refreshing. 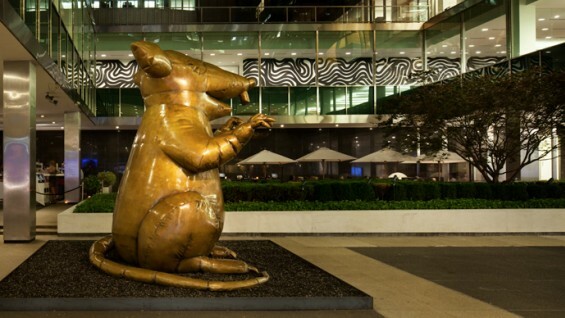 In this respect it is worth noting that the Lever House art program is privately sponsored, with the former Whitney Museum of American Art curator Richard Marshall organizing its exhibitions. It is rare to find such baldly partisan expression as the Bruces’ in outdoor art sponsored by public institutions. Offense is so easily taken, especially if taxpayer money is involved. 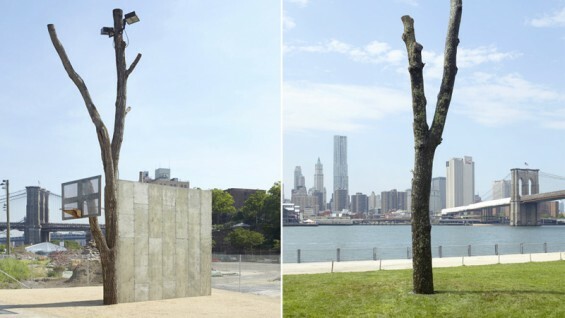 “People,” the most complex of three pieces there, consists of a poured concrete handball wall with a tall dead tree attached to one vertical edge and an old basketball hoop and backboard attached to a truncated branch. Placed near a chain-link fence setting parkland off from an adjacent construction site, it looks less like art than like an ad hoc construction waiting to be broken down and carted away by a demolition crew. Miming the often camouflaged urban texture of construction, Tuazon’s work foregrounds structures that often recede into the periphery of the city dweller’s vision. In the process, unknowing park visitors become viewers and active users of his sculpture, which invites athletic use while emphasizing the demarcations between parkland and construction, the city’s material reality and the ways it manifests.